As with the R8 GT coupe, the R8 GT Spyder will be assembled in a run of just 333 cars. 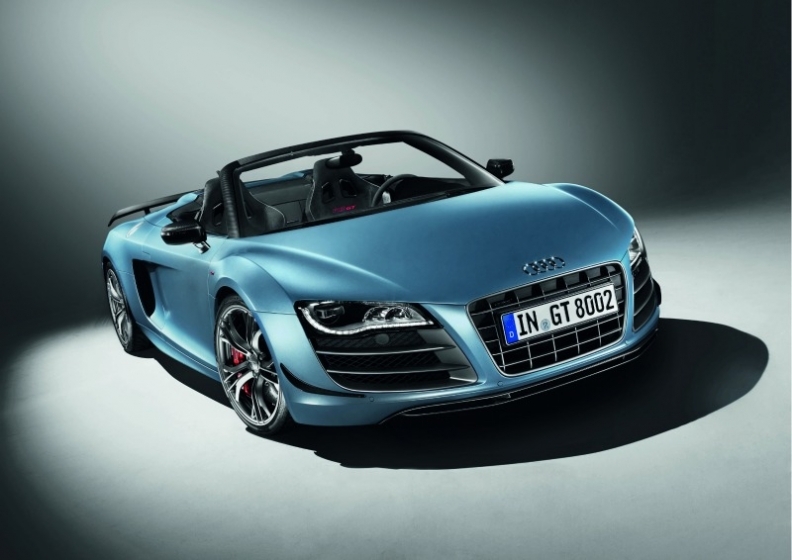 Volkswagen AG brand Audi has unveiled a limited-edition, open-top version of the mid-engine R8, called the GT Spyder. The two-seater will debut at this year's IAA in Frankfurt, just ahead of a European sales launch and will cost 207,800 euros in Germany. As with the R8 GT coupe, the R8 GT Spyder will be assembled in a run of just 333 cars at Audi's Neckarsulm manufacturing plant in Germany. It draws heavily on the earlier R8 GT coupe, sharing elements of its styling, lightweight construction and mechanical package. 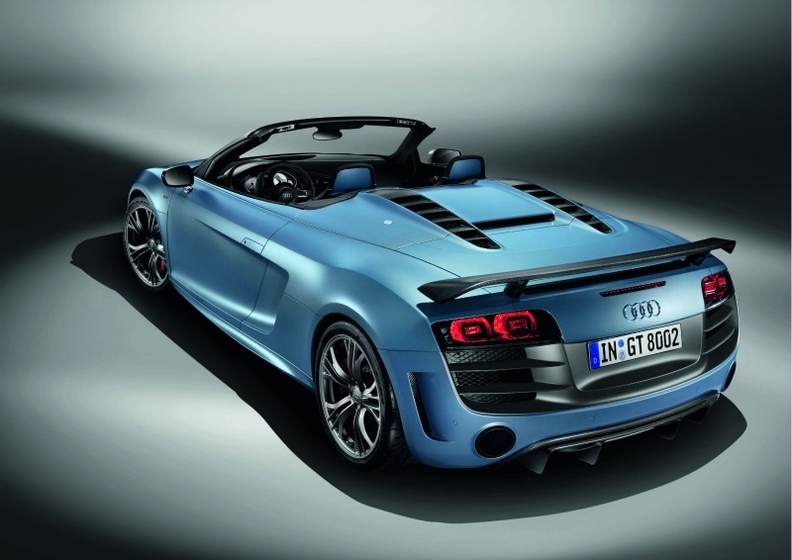 At the heart of the new Audi is a powered-up version of the standard R8 Spyder's 5.2-liter V10 engine producing 552 hp. The car uses a standard six-speed sequential-manual gearbox with paddle-shift capability and a viscous-coupling all-wheel-drive system set up to provide a nominal rear-wheel-drive bias. Audi claims that the R8 GT Spyder can reach 62 mph (100 kph) in just 3.8 seconds and reach a top speed of 197 mph. With select carbon-fiber body panels, a lightened interior and carbon-ceramic brakes helping to reduce curb weight over the standard R8 5.2 FSI quattro Spyder, the R8 GT Spyder is claimed to reach 62 mph (100 kilometers per hour) in just 3.8 seconds and reach a top speed of 197 mph. Setting the car apart from its standard sibling is an updated aerodynamics package aimed at increasing high-speed downforce. Included is a dual-lip front splitter, a redesigned diffuser element, round chrome exhaust pipes and darkened taillight lenses. An electrically operated fabric roof opens in 20 seconds and at speeds up to 30 mph, stowing behind the cabin underneath a carbon-fiber cover. A deep well beneath the hood at the front provides space for luggage, with Audi claiming the car offers up to 100 liters of storage space.